The U.S. Climate Prediction Center says the 2015 Atlantic hurricane season will likely be below-normal. But that’s no reason to believe coastal areas will have it easy, say the weather experts at the center, which is part of the National Oceanographic and Atmospheric Administration (NOAA). For the hurricane season, which officially runs from June 1 to November 30, NOAA is predicting a 70 percent likelihood of 6 to 11 named storms (winds of 39 mph or higher), of which 3 to 6 could become hurricanes (winds of 74 mph or higher), including zero to 2 major hurricanes (Category 3, 4 or 5; winds of 111 mph or higher). While a below-normal season is likely (70 percent), NOAA says there is also a 20 percent chance of a near-normal season, and a 10 percent chance of an above-normal season. Last month, Colorado State University forecasters said they expect the Atlantic Ocean may have one of its quietest hurricane seasons in decades. William Gray and Phil Klotzbach have predict seven named storms versus the 30-year average of 12. Three of them may reach hurricane strength. They said cooler water in the Atlantic and an El Nino in the Pacific are behind the expectation of the below-normal activity, an analysis echoed by NOAA. El Niño is already affecting wind and pressure patterns, and is forecast to last through the hurricane season, according to Gerry Bell, Ph.D., lead seasonal hurricane forecaster with NOAA’s Climate Prediction Center. “El Niño may also intensify as the season progresses, and is expected to have its greatest influence during the peak months of the season. We also expect sea surface temperatures in the tropical Atlantic to be close to normal, whereas warmer waters would have supported storm development,” Bell said. Tropical Storm Ana is included in this current NOAA outlook Ana, but its pre-season development is not an indicator of the overall season strength, the forecasters said. They said Ana’s development was typical of pre-season named storms, which often form along frontal boundaries in association with a trough in the jet stream. This method of formation differs from the named storms during the peak of the season, which originate mainly from low-pressure systems moving westward from Africa, and are independent of frontal boundaries and the jet stream. “A below-normal season doesn’t mean we’re off the hook. As we’ve seen before, below-normal seasons can still produce catastrophic impacts to communities,” said NOAA Administrator Kathryn Sullivan, Ph.D., referring to the 1992 season in which only seven named storms formed, yet the first was Andrew – a Category 5 Major Hurricane that devastated South Florida. NOAA released a new prototype storm surge watch/warning graphic to highlight areas along the Gulf and Atlantic coasts of the United States that have a significant. The new graphic introduces the concept of a watch or warning specific to the storm surge hazard. This week, May 24-30, is National Hurricane Preparedness Week. 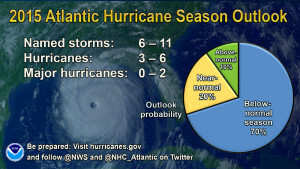 NOAA said it will issue an updated outlook for the Atlantic hurricane season in early August, just prior to the historical peak of the season. Last year turned out to be a quiet hurricane season as NOAA predicted. NOAA also issued its outlook for the Eastern Pacific and Central Pacific basins. For the Eastern Pacific hurricane basin, NOAA’s 2015 outlook is for a 70 percent chance of an above-normal hurricane season. That outlook calls for a 70 percent probability of 15 to 22 named storms, of which 7 to 12 are expected to become hurricanes, including 5 to 8 major hurricanes. For the Central Pacific hurricane basin, NOAA’s outlook is for a 70 percent chance of an above-normal season with 5 to 8 tropical cyclones likely. The President said that Climate Change is the biggest national security problem this nation faces. Syria, Iraq, Afghanistan, Yemen are all on fire and Climate Change is his big issue. Jack, never trust anything from Colorado State U. They are all smoking that weed up there.